In one week only, Vashti Cunningham’s professional sport life took a turn towards a bright future. Few days before the indoor world competition, and precisely on the 12th of March in Portland, Cunningham suriprised everyone jumping 1.99m and on the top of the high jump world rankings. 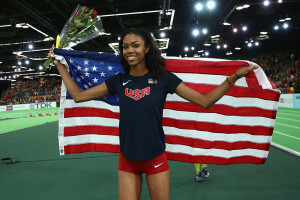 From Portland to Portland, this time with a world champion medal around the neck: on the past Sunday Cunningham became the the youngest athlete ever to win an indoor World title, at the age of 18 years and 63 days, thanks to a 1.96 jump. The icing on the cake was put by Nike, knocking at the athlete’s door with a contract to sign to project her in the professional world. Vashti Cunningham then left Bishop Gorman High School uniform to join the Nike star team. The ’99 athlete did not manage though to beat the ”youngest athlete to join Pro world’, a title which has belonged since last year to the sprinter Candace Hill, enrolled by Asics at 16 years after having run 100m in 10”98, first Junior to break the 11” wall. One thing is sure: with or without sponsor, we will still hear about Vashti Cunningham.